HOW DOES EXPERIENCE CHANGE US? All experience contributes to the flow of our lives at one level of consciousness or another. It disturbs equilibrium, it evokes the processes of homeostasis. New models of the manner in which the stress response affects behavior includes the influence of subclinical stress – autonomic nervous system activity that can be evoked by any mismatch between internal models of the environment and the apparent external world –the mismatch evokes what has been termed cognitive dissonance. Jean Piaget, one of the founders of the modern understanding of child development regarded assimilation and accommodation as the central processes of the development of knowledge. The neurology of “error detection” is significant here. When there is a mismatch between ACTIONS and INTENTIONS (the animal does not get a desired result) cognitive dissonance occurs (perhaps in proportion to the importance of the act), and the organism is in some measure stressed. 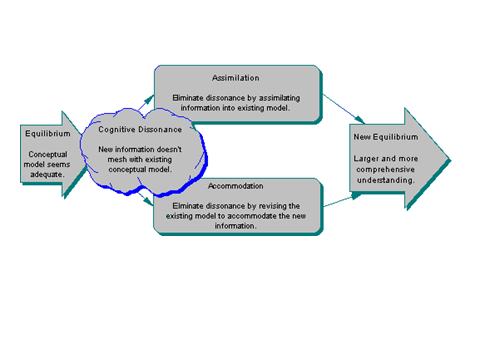 Internal models are based on countless experiences in which new information is assimilated into the model (set of expectations) or accommodated (the model changes slightly). In the stream of ongoing experience, the world is always being “tested” to see that expectations are more-or-less likely to be met (“reality testing”) stimuli that meet certain criteria are also “tested” to see if they “fit in” with preceding experiences that they more-or-less resemble (“establishing coherence”). When stimuli do NOT meet the tests (which are highly automatized and always ongoing) the organism’s attention is refocused on the “anomaly” — the unexpected experience. The internal model is challenged and the level of attention is enhanced, possibly even up to conscious investigation. Depending on pre-existing stress levels, learning something new can be intensely pleasurable, particularly when there is a distinctive insight or “aha!” reaction. Infants in particular and most of us more-or-less SEEK novelty and learning experiences, but this seems to be modulated on our real or perceived progress towards meeting key biological needs.